One of the symbols of the Pelikan brand has long been the green and black pin stripe pattern affectionately nick-named Stresemann. While this may be the iconic design that the company is known for, I would wager that few of their designs have captured the imagination (or the eye) of collectors, users, and the even the uninitiated alike as the Pelikan tortoise finish. The tortoise has been an integral part of their line up and has been produced in many variations over the decades. It would certainly be a daunting challenge to focus on all of the tortoises released over time so to keep this post manageable and engaging, I will present you with a discussion on just the modern tortoises, those produced from 1980 through today. Don’t despair though if you have a soft spot for the tortoises of days gone by as I hope to revisit this topic and feature those tortoises from which our modern designs take their inspiration at some point in the future. Amongst Pelikan enthusiasts, lamenting the lack of a tortoise variant of one model or another always seems to be a popular topic of conversation. To the collector, it would seem a no brainer; make a tortoise variant and how could it not fly off of the shelves. Unfortunately, it seems that time and time again when Pelikan does make such a beauty, they don’t turn out to be the great sellers we all think that they should be. They linger on shelves and stock ends up getting discounted. Once the limited production run ends, supplies become sparse, prices creep up, and only then do these beauties become the coveted treasures that we know them to be. I often see a lot of uncertainty and confusion arise when people try to identify tortoise variants that they’ve come across. There are even many collectors out there who haven’t seen all of the variations as some of them have either been so limited in production or otherwise relegated to a particular region of release as to not be widely known. What follows is the best accounting of the various modern releases that I’ve been able to put together and I hope that it serves as a useful reference. I believe that I’ve included every known variation of tortoise from 1980 through 2014 but, of course, the nature of these pens makes them somewhat elusive which is also part of their mystique. There is always the chance that I’ve missed one. Care to guess just how many tortoises have been available over the last 34 years? If you thought the answer was sixteen, then you are indeed an aficionado. If you weren’t even close, read on. Known models include the; M200 Brown, M250 Brown, M400 Brown (’84-’96), M400 Brown (GK Type 1), M400 Brown (GK Type 2), M400 White, M415 Brown, M450 Vermeil, M600 Brown, M600 White, M800 Brown (’88), M800 Brown (’13), M101N Brown, M101N Red. The M200 tortoise variant is a relatively harder to find model that often goes misidentified in auction type sales. Many have never even heard of this variant but there was indeed an M200 tortoise. While it’s release date is not for certain, I think 1987/88 is a reasonable approximation. These are solely seen in the pre-1997 styling. They can be identified by way of a brown tortoise barrel, lack of a trim ring on the section or at the piston knob, single cap band, and derby cap top with an etched two chick logo. The furniture is gold, the cap and piston knob are dark brown, and the nib is gold plated stainless steel. Instead of an ink window, the barrel has transparency in order to visualize the ink level. The M250 Levenger brown tortoise is often referred to as a company sanctioned “frankenpen.” Rest assured though that this was an official release, in this case, made for the Levenger company. The sale ad is depicted below though, interestingly, it does not give a model number. Released in 1997, it is composed of a pre-1997 M600 barrel and an M200 cap. You will notice that the trim ring at the piston knob is somewhat thicker, a hallmark of the pre-1997 M600. The M250 can be identified by a brown tortoise barrel, a thick trim ring at the piston knob, no trim ring on the section, double cap bands, and a derby cap top with an etched two chick logo. The furniture is gold, the cap and piston knob are dark brown, and the nib is monotone 14C-585 gold. This model too has barrel transparency in order to view the ink level. There also exist at least one other variant of the M250 brown tortoise. This non-Levenger model comes in the pre-’97 trim style with a derby cap top. It is identical to the M200 brown tortoise depicted above except for a 14C-585 monotone gold nib. This was reportedly made for a German department store. 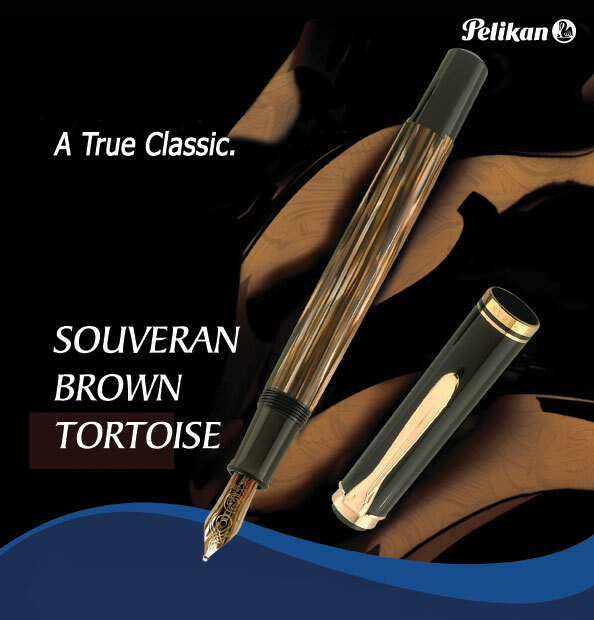 There is also rumor of another brown tortoise with the standard M250 trim with double cap bands and lack of trim ring at the piston knob but this model is unconfirmed and “unknown” to the Pelikan archives. This M400 variant was introduced in 1984, just two years after the reintroduction of the M400 series. These variants will all be characterized by pre-1997 trim. Cap bands will either be inscribed “W.-Germany” dating it from roughly 1984-90, or “Germany” with production dates of roughly 1990-96. Common lore contends that the nibs of the earlier “W.-Germany” models are slightly superior to those of the later production years. This variant is distinguished by a brown tortoise barrel, lack of a trim ring on the section or at the piston knob, single cap band, and a crown cap top with an etched two chick logo. The furniture is gold, the cap and piston knob are dark brown, and the nib is monotone 14C-585 gold. Barrel transparency allows for viewing of the remaining ink level. I am certain that this was an M400 tortoise variant though it did not enjoy a wide release. This was an edition that was sold through the Galeria Kaufhof department stores and available circa 2004. Galeria Kaufhof seems to have enjoyed a special relationship with Pelikan over the years, being privy to many special, limited, or overstock releases. This variant is characterized by a brown tortoise barrel, a trim ring on the section, two trim rings at the piston knob, double cap bands, and a crown cap top with a painted logo. Compared to the M400 tortoise from 1984-96, there is a significantly upgraded trim package on this model. The furniture is gold colored, the cap and piston knob are dark brown, and the nib is two-toned 14C-585 gold. Remaining ink level is again determined via the transparency of the barrel. Of all the tortoises listed here, this is the one pen that I am the least sure about but I post it here for your consideration and discussion. I’ve only seen one example and cannot verify its validity. This was reportedly another Galeria Kaufhof edition that was found for sale in their store sometime in the mid-2000’s. It is distinguished by a brown tortoise barrel, lack of a trim ring on the section or at the piston knob, single cap band, and a derby cap top with an etched two chick logo. Capped, this could easily be the M200. 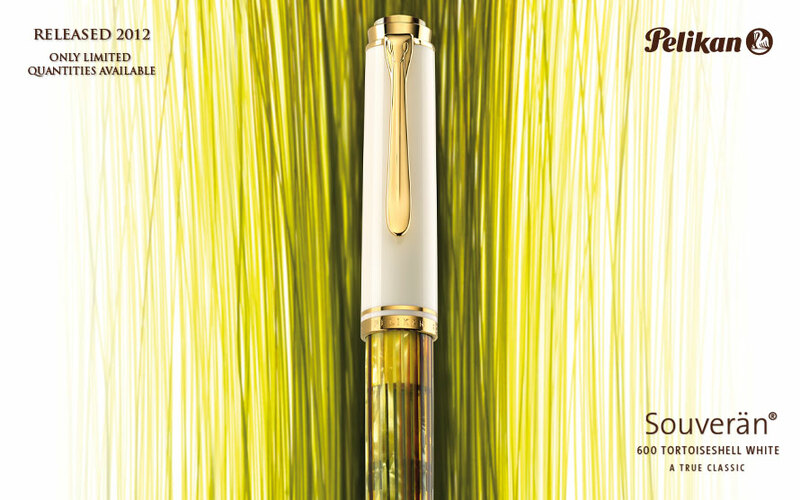 Once uncapped though, it is adorned with a two-tone 14C-585 gold nib which is what would distinguish it from the M200. The furniture is gold and the barrel is transparent. 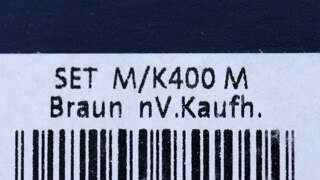 The box label is shown below and is the only evidence available to substantiate this as an M400 brown tortoise variant. The M400 White Tortoise seems to be unique in terms of its coloring, appearing to have been the first white tortoise ever introduced. The model debuted in 2004 and remains in production as of this post. Rather than brown, the barrel has more of a honey green appearance with wonderful transparency which allows visualization of the ink contained therein. It has all of the trim of a post-1997 M400 including a trim ring at the section, two trim rings at the piston knob, double cap bands, and a crown cap top. The furniture is gold and the cap and piston knob are white. Given the range of years this model was produced, pens released before 2010 will have the painted one chick cap top whereas pens released after 2010 will have the 24K finished one chick cap top. It should be noted that earlier versions of this pen were known to have a defect which resulted in cracks developing at the lip of the cap which was corrected later into the run. This special edition release came about around June of 2009. 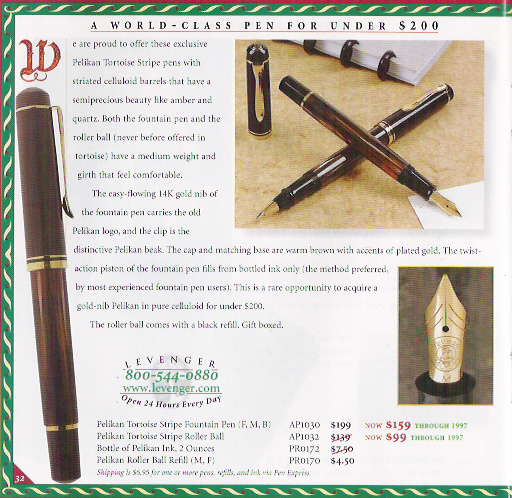 There were three catalog numbers indicating that the pen was available in Fine, Medium, and Bold nibs. Identifying characteristics include a brown tortoise barrel, lack of a trim ring at the section or piston knob, double cap bands, and a crown cap top with a painted one chick logo. The furniture is gold, the cap and piston knob are a dark brown, and the nib is monotone 14C-585 gold. The barrel is transparent to allow visualization of the ink level. The M450 is another special release by Pelikan which took a different direction with regards to the usual tortoise finish. This model, released in 2004 and discontinued by 2009, is distinguished by the piston knob and cap being done in vermeil, a process of placing a thin layer of gold over sterling silver which provides increased durability. Rather than brown, the barrel is more of a honey green tortoise pattern. There are no trim rings at the piston knob but there is one on the section. The crown cap top is painted with a single chick logo. The nib is two-tone 18C-750 gold and the barrel is translucent to allow for viewing of the ink level. 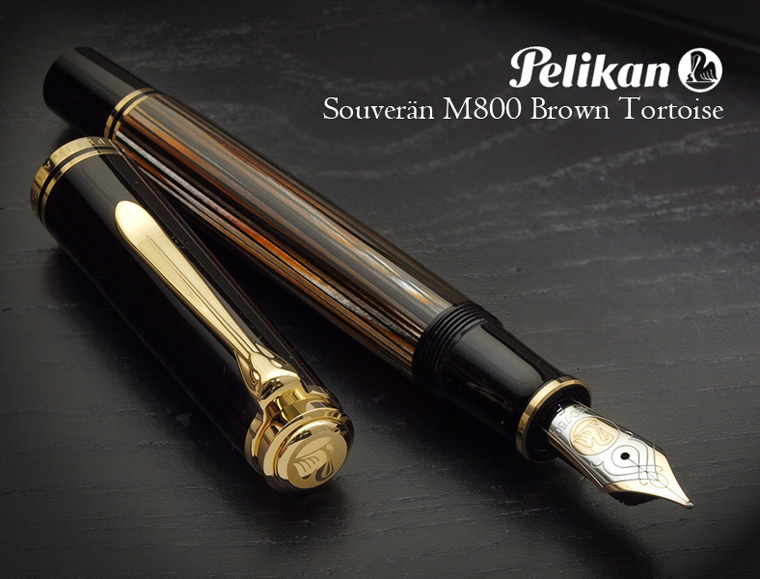 The old-style M600 brown tortoise is one of those pens so seldom seen that many debated its very existence for a long time. While an exact release date is not widely known, it is a pre-1997 pen making its production date somewhere between 1985 – 1996. It was reportedly released for the Japanese market. It has a brown tortoise barrel, a thicker trim ring at the piston knob as well as a trim ring on the section, double cap bands, and a crown cap top with an etched two chick logo. Because it is a pre-1997 M600, it is the same size as the M400. It has gold furniture and a monotone 18C-750 gold nib. This pen’s barrel was used to later build the M250 tortoise released by Levenger. 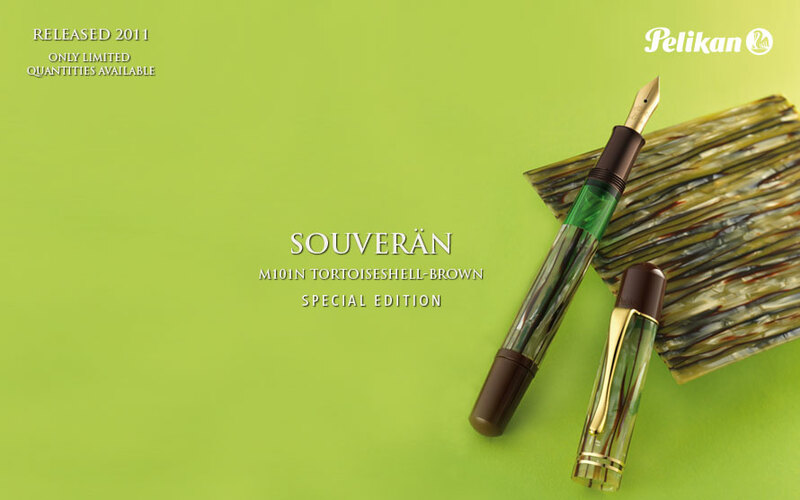 The new-style M600 brown tortoise is also a very rare pen. It came in a set composed of an M600 fountain pen and a K600 ballpoint pen in the tortoiseshell brown finish. The set was released in 1999 to commemorate the 130th anniversary of Maruzen, a well-known and long-established pen shop in Japan. Consequently, these sets were only available in Japan and were limited to just 500 pieces. The set came in a presentation box along with a certificate explaining what the set was commemorating. The certificate was signed by H.K. Loo, president of Pelikan Holding AG. The M600 white tortoise was released in 2012, following the discontinuation of the M400 white tortoise. The color scheme and pattern are identical to that of the M400 but now in an M600 sized pen. The barrel is done in the honey green tortoise pattern with two trim rings at the piston knob, a trim ring on the section, double cap bands, and a 24K finished crown cap top with a single chick logo. The cap, section, and piston knob are colored white. These come with two-toned 14C-585 gold nibs in sizes of EF, F, M, and B. The M800 brown tortoise is well-known to have existed but its provenance has been debated over the years. The common lore is that this pen was commissioned by vendors in Spain for the Spanish market. They were produced in 1987/88, around when the M800 was first introduced. Nobody knows for sure how many pieces are out there but some accounts are that approximately 750 pens were made. The story goes on to say that these did not sell well and that there was a closeout at the Pelikan factory for the price of 300 Deutsche Marks. Today, when you can find one, they command a premium price, upwards of $2500+. 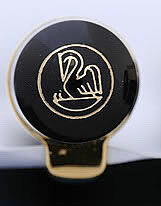 These are identified by the two chick logo on the gold medallion crown cap top and a solid gold medallion on the piston knob. The barrel, of course, is brown tortoise with two trim rings at the piston knob, a trim ring on the section, and double cap bands. 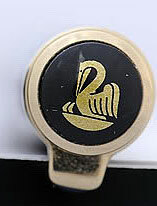 The furniture is gold and the cap band is marked “W.-Germany.” The nib is two-toned 18C-750 gold. The M800 tortoise variant was reintroduced in 2013 to great fanfare. It is the standard M800 size in brown tortoise finish. There are two trim rings at the piston knob, a trim ring on the section, double cap bands, and a crown cap top finished in 24K with a single chick logo. The nib is two-toned 18C-750 gold. This pen was released in 2011 and is part of a series that is a modern take on the 101N line originally released in 1937. 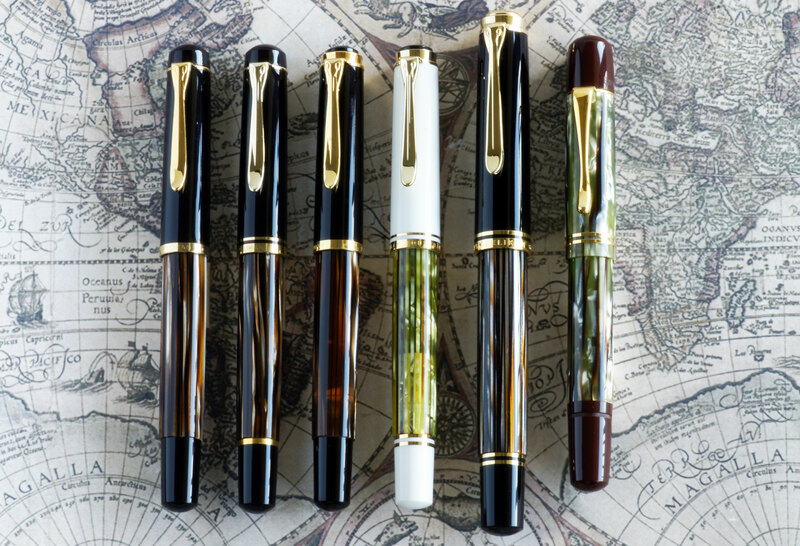 There were six models overall in that series over the years and Pelikan has rereleased three of them to date, two of which are tortoise versions. The pen has a tortoiseshell pattern on the barrel and cap. The cap top, piston knob, and section are a dark brown. The cap top is domed and has an etched one chick logo. There are two cap bands and no trim rings on the barrel or section. The furniture is gold. 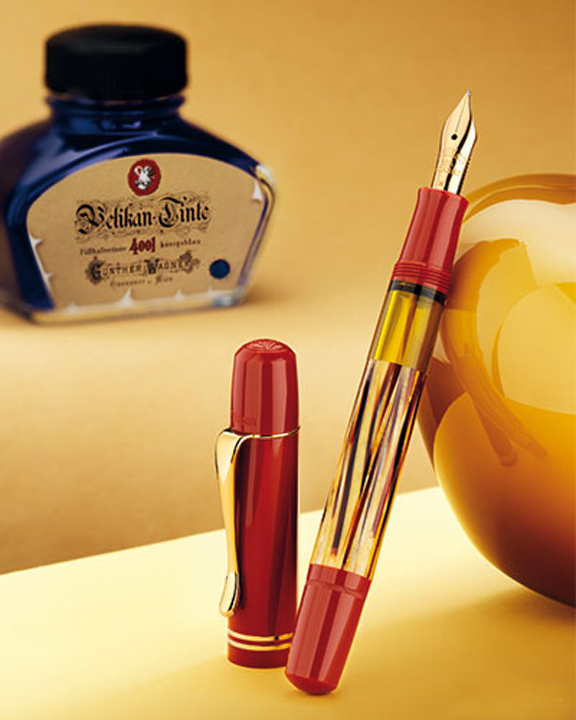 The nib is monotone 14C-585 gold with the word Pelikan inscribed, similar to the vintage models. Unlike most of the other tortoises discussed thus far, rather than a transparent barrel, this M101N has a green ink window just above the section. There is not much yet to say about the M101N tortoiseshell red as it has yet to be released though release should be anytime this month. This is the third in the M101N series and follows the previously released tortoiseshell brown and lizard. It has a red cap, piston knob, and section without any trim rings on the barrel or section. The cap has two cap bands and the domed top is etched with a one chick logo. The ink view window is amber in color and the nib is the same as described above for the brown tortoise. There is a lot of anticipation for this pen and it will enjoy the distinction of being Pelikan’s newest tortoise but, hopefully, not for long. With the M101N tortoiseshell red, my discussion on the modern tortoise is concluded. I hope that I’ve been able to show the diversity and beauty of this subset of Pelikans. I’m sorry to have taken a while longer than I would have liked between post but I wanted to make this a thorough and informed review. I hope that you have found it an enjoyable and informative read. Comments are always welcome. This is just the sort of readable, informative article I’ve longed for. I’m sure to come back to re-read it…thanks for posting it! I used to receive Levenger catalogs on a regular basis, and I do remember that brown tortoise special. One thing that comes to mind…wasn’t there a mention on FPN somewhere of an upcoming (in 2015) M600 SE in pink (what?!) tortoise? I for one am really curious to see how Pelikan will pull such an idea off. I have heard rumor of the M600 pink tortoise but I will withold any judgement until actually seeing the bird in person. Afterall, the M200 Telekom model in pink and grey is quite an attractive pen. Let’s see what they can do. Ah, I had forgotten about that pink and grey M200. That certainly was well rendered! I will keep the faith about the rumored pink tortoise. It will be interesting, at the very least. 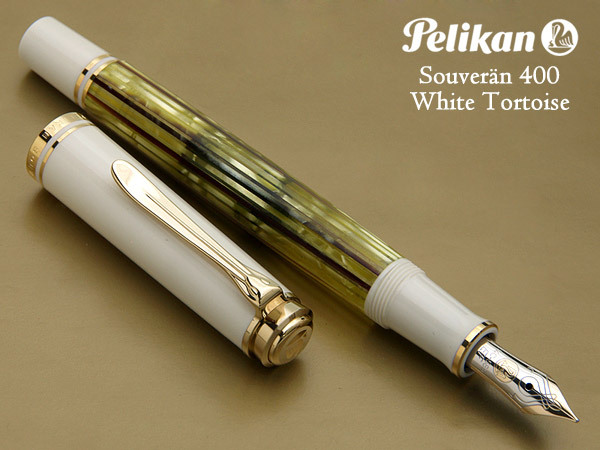 Do you know if Pelikan plans on any new releases of a white tortoise? I’d love to see one in an M800 but rereleasing the M600 would be great too. I’m not aware of any upcoming tortoise releases. Since we are getting an M600 Pink, I would not expect to see a white tortoise re-release in that line, at least for this year. Since we got the M805 Stresemann and the M805 Clear Demo, I also wouldn’t expect to see anything more in the M800 line this year but that’s just my opinion. Unfortunately I don’t have any insider info to share. Wonderful write-up! I have the white/tortoiseshell M400, which I’ve always described as ‘milk & honey’ or ‘Ivory & tiger’s eye’. Beautiful pen. I also have the M450 vermeil, but sadly, the rose gold plating has begun to tarnish in recent years. I suppose my only alternative is to send it to Pelikan HQ to have the cap and barrel-end replaced. Pelikan is, by far, my favourite brand, and I have learned much about them from your excellent blog, which I have linked over to my own. Keep up the good work and while I’m here, have a Merry Christmas! Thank you for your kind words about my post and my site. I’m happy to hear that you’ve found my content informative. The M400 and M450 tortoises are two beautiful birds. Enjoy them and Merry Christmas! 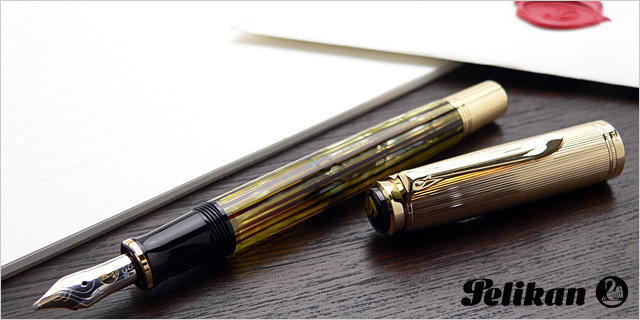 The m450 is one of the finest editions of the Pelikan tortoise finish. Should have grabbed one while they were around! They do pop up from time to time still but you have to be patient and expect to pay a nice fee once you find one. A beautiful piece though which would be a treat to own. Yay! I finally figured out the lineage of my tortie. I purchased it as NOS from Swisher Pens (sadly defunct) in the early 2000s and it appears to be a M400 from 1990-1996 (Germany on the barrel). It’s one of my favorites and I wish I had purchased a replacement nib at the time. Oh, well. I still love it. Hello Jen. I’m very pleased to hear that my post was able to help you identify your pen. That’s a nice one you have there. Enjoy it!